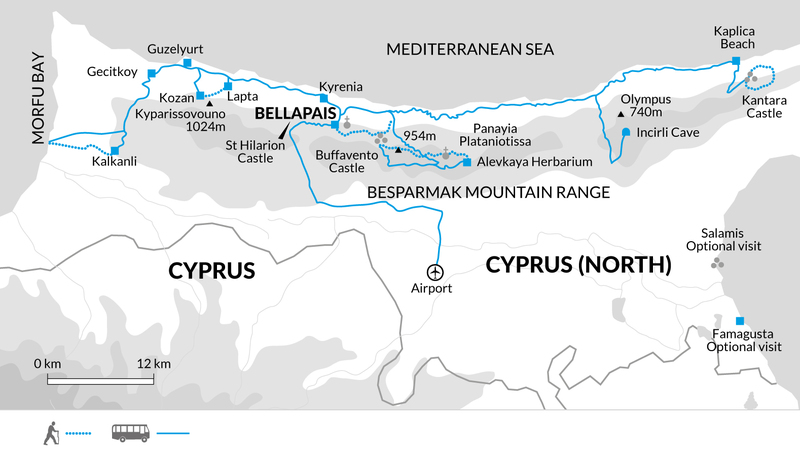 Explore one of the most unspoilt regions of the Mediterranean on this walking trip through North Cyprus' beautiful Besparmak Mountains. Follow quiet, flower-rich mountain trails and discover imposing ruined castles, with stunning cobalt sea backdrops. Upon arrival, we will settle in to our hotel on the outskirts of Bellapais village - our base for the next week. Close to Kyrenia and with panoramic views of the town, this friendly hotel offers comfortable rooms, and a swimming pool in which to enjoy a refreshing dip at the end of each day's walking. Depending on your arrival time, you may choose to explore Bellapais village or head into Kyrenia to sample some excellent North Cyprus food and explore the town's beautiful and eclectic mix of Venetian facades, mosques and minarets. Kyrenia is particularly famous for its 'picture postcard' vista of its striking Crusader castle and old harbour set against the dramatic backdrop of the Besparmak Mountains. Our main briefing will be after breakfast this morning before driving to the start of our first walk in the Besparmak Mountains. From the Arapkoy area, we will walk through the mountains to Bellapais village, taking a picnic lunch en route in the forest. Made famous by Lawrence Durrell in his 1950s award-winning autobiography, Bitter Lemons, much of the Bellapais village still retains the easy charm of those Durrell days. The village's main attraction is Bellapais Abbey. Now an imposing ruin with spectacular views of Kyrenia and the Mediterranean Sea, it was founded by Augustinian canons fleeing Palestine in 1200. The abbey flourished until it was looted and vandalised during the 14th century Genoese invasion. It went on to earn a reputation for scandal and corruption, eventually shutting down in the 16th century. After visiting the abbey and the famous Tree of Idleness, under which Durrell would often drink coffee, we continue our walk down the hill to the hotel. Later this afternoon, we will drive into Kyrenia for an optional visit to Kyrenia Castle and the Shipwreck Museum, which houses the remains of a 4th century BC merchant ship, with time to stroll around the harbour. 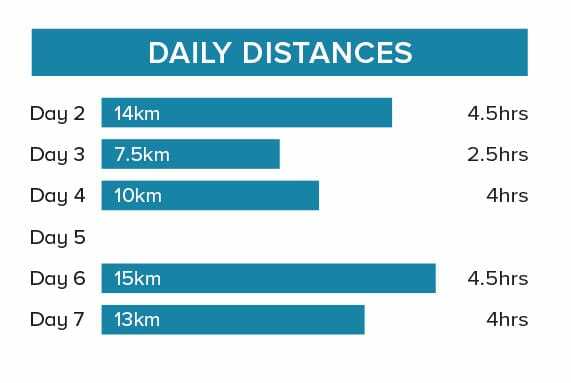 Today's 14 kilometre walk is expected to take around four hours-and-half hours with 300 metres of ascent and 350 metres of descent. Heading east, along the coast to Kantara Castle, through a beautiful rural landscape of green fields, olive groves and small villages. En route, we will stop off at Cyprus' largest cavern, Incirli Cave, to see its impressive collection of stalactites and stalagmites along its 100 metre passage. Kantara Castle has seen its fair share of conflict over the centuries. Indeed, Richard the Lionheart won a famous victory here when he defeated the self-proclaimed king of the island, Isaac Komnenos, after the latter's ill-judged slight against Richard's fiancée. After visiting the castle, we have lunch and then enjoy a walk around the varied landscape of the stunning Karpaz Peninsula upon which the castle stands. The descent is gradual with spectacular coast views, can see Turkey on a clear day. Before driving back to the hotel, we will have the opportunity to swim and relax on the beautiful sandy Kaplica beach. Today's seven-and-a-half kilometre walk is expected to take around two-and-a-half hours with 50 metres of ascent and 450 metres of descent. This morning we visit Saint Hilarion castle, a stunning historic fort overlooking the Mediterranean Sea . There is time to explore the three floors of the castle complex on foot, one of the best preserved of the Crusader castle. Built into the hillside there are some steep sections and steps to climb to the upper section. We meet at the café for a refreshing home made lemonade before driving to the western edge of the Besparmak Mountain range. Starting in the village of Kozan, we will walk among wild flowers and orchids to the ruins of the Sinai Monastery. Although very little is known about this building's history, archaeologists are in agreement about its Byzantine importance. We continue walking over the mountain range, through the pine forest to Lapta Village, taking a picnic lunch en route, before returning to our hotel. Today's 10 kilometre walk is expected to take around four hours with 150 metres of ascent and 450 metres of descent (including a short steep section). Today has been left free for you to use as you wish. You may choose to visit Famagusta - once one of the richest cities and most important trading ports in the world. The so-called 'City of 365 Churches' has been ravaged by severe wars and earthquakes throughout history, but still contains beautiful examples of medieval and gothic architecture. William Shakespeare is purported to have used it as the setting for Othello and the Venetian Citadel, overlooking the harbour, is popularly known as Othello's Tower. Just five miles to the north of Famagusta is the ancient site of Salamis, which is also well-worth a visit. With its significant collection of Mycenaean, Roman and Byzantine artefacts, it is the most important ancient city on the island. Alternatively, you may prefer to use your day to relax, spending time by the hotel's pool or on one of the local beaches. Today we head out to the West Coast, through one of the most fertile agricultural regions in Cyprus, growing an abundance of fruit and vegetables. From the village of Kalkanli, our walk takes in pretty countryside, through ancient olive groves, some trees are over 1,000 years old, and past colourful flowered fields. We have a picnic lunch en route, before descending to the coast. Our walk finishes by the sea, with time for a drink in the beach cafe before continuing to visit the Iron Age Tumba tou Skuru 'Kings Tombs' archaeological site. Its excavation in the 1970s uncovered just a fraction of the site and many mysteries about its use and the people buried there remain unsolved. Today's 15 kilometre walk is expected to take around four-and-a-half hours with 200 metres of descent. This morning, we head again into the Besparmak Mountains and to the highest of the Kyrenia strongholds, the ruined fortress of Buffavento. The name means 'buffeted by the wind' and a walk up to the top of the highest tower helps us to understand why. The zig zag path gradually ascends to the ruins, with some steeper steps to get to the top to the castle. On a clear day, our efforts are rewarded with a spectacular view of half the island, with the Troodos Mountains, Famagusta and Nicosia stretching out beneath us. Our main walk for the day takes us to the base of Besparmark, translated as 'The Five Fingered Mountain' because of its distinctive jagged peaks. Legend has it that the mountain was formed when the Byzantine hero, Dhiyenis Akritas, leapt across the sea from Anatolia, leaving his handprint forever etched into the landscape as he landed. We follow a trail into the pine forest, keeping an eye out for orchids (in spring time). Enjoy a picnic lunch at the tiny Church of Panayia Plataniotissa, with views across to Nicosia. Meeting the bus we drive the short distance to the final walk, under the forest canopy we walk to an abandoned monastery. Today's walks total 13 kilometre which is expected to take around four hours with 70 metres of ascent and 170 metres of descent. The forest paths are uneven under foot in places and undulating with a few very short steeper sections. Our trip ends after breakfast this morning. Bring light and comfortable clothing that can be layered according to the temperature. The weather conditions in the mountains can be changeable, and it can become cool, especially at night, so bring warmer layers. Tops made from wicking materials which keep you drier and warmer are recommended as a base layer, and walking trousers are preferable to trousers of heavier material such as jeans. A waterproof jacket is advisable for early spring as there may be sporadic rain showers. Although entirely voluntary, tipping is a recognized part of life in this region of the world. Some local staff will look to members of the group for personal recognition of particular services provided. In order to make things easier for you, the Explore Leader may organise a group's tips kitty and if this is the case, they will account for it throughout the trip. Bellapais Monastery Village Hotel is located in the foothills of the Besparmak Mountains, within walking distance of Bellapais village and the abbey. It is in an area of outstanding natural beauty around three kilometres from Kyrenia, with views down to the coast. With two outdoor swimming pools and a roof terrace there is a lot of space to relax outside and enjoy these sea views. From here it is also easy to discover nearby Bellapais, or take the courtesy bus into Kyrenia to explore the harbour, castle and narrow backstreets. The hotel facilities include the two outdoor swimming pools with pool loungers, a pool bar and an indoor pool. There are two restaurants: one a roof restaurant with a roof terrace bar. Breakfast is included. Lunch snacks are available at the pool bar, while a la carte menus are available for dinner in the restaurants. Other hotel facilities include a sauna, a steam bath and massage treatments. All the standard rooms have air -conditioning, satellite television, direct dial telephone, minibar, safe box, and an en suite bathroom with shower and hairdryer. A kettle, cups and teabags/coffee is provided in the rooms but please note that a bottle of milk will be charged for. All the rooms have a balcony or terrace. Walks on 5 days for between 2.5 to 4.5 hours, mainly on established paths. Get off the beaten track and explore the real North Cyprus. During this trip you'll have the opportunity to partake in a number of day walks that showcase the mountains, beaches and history that the region is famed for, as well as having time at leisure for you to relax at the hotel or explore Kyrenia.